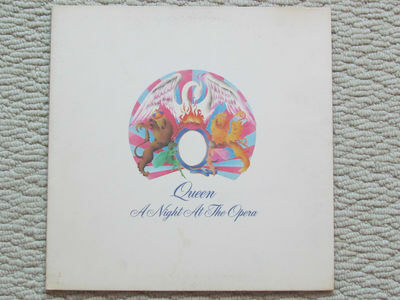 Queen - A Night At The Opera. 1975 press on Elektra butterfly label. Embossed cover. Gate fold. Including - Bohemian Rhapsody. Cover VG+++ No splitting. No writing. Very very minimal wear. Basically excellent condition on cover. No spine wear, 3 out of 4 sharp corners. very light ring wear starting on back. Vinyl - is Excellent and very close to near mint, except for 3 or 4 small, and i mean small, hair marks on side one. Play tested.